Well done to our three school football teams who have played several exciting matches during September and October. The Senior B team had their first victory over Bishop Galvin on Thursday while the Junior team were very unlucky in their last match against local rivals St. Pius. Our Senior team have qualified for the semi final of the shield following a thrilling victory over Scoil Eoin Bosco in Castleknock. The semi final will be played at the same venue after Halloween. 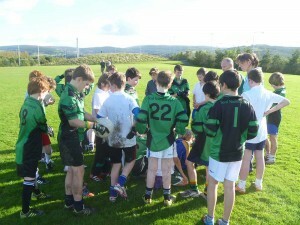 Yesterday St Joseph’s B.N.S played……in a game of Gaelic Football.It was the quarter final of the shield. The game was played in St Bridget’s on the North side of Dublin. I played at right full back! At half time St Joseph’s was losing by a 3 points. Mr Brennan said to us don’t give up. There is only one shot in it and kick it out to the wings instead of the middle. blew the whistle. The game was over. We all jumped up and celebrated at the end. Our new Comenius project Window on Europe – Learning to Learn was launched in Szezecin, Poland on October 15th. It was attended by teachers and principals from the six participating schools, Spain, Ireland, Norway, France, Poland and Italy. The schedule of activities and mobilities for the next two years is now in place. The website for the project www.windowoneurope.eu is available and it will be central to many of the activities during the year as ICT will be used in all aspects of the project. Pupils will be exchanging emails, videos and sound files, participating in joint projects with pupils from the other schools. We will be hosting pupils and teachers from the participating countries and we also hope to bring pupils from St. Joseph’s to some of the partner schools over the next two years.